The night of August 14th, 2017 was a night to remember for Sundari Chaudhari (35) from the Bhitaria village of the Joshipur Rural Municipality, Kailali, Nepal. Woken up by a slap in her sleep, Sundari recalls the flood that inundated her house, “I squirmed and saw my mother-in-law warning me against rising water level.” The flood swept away her cattle and destroyed her paddy crops. The flood was triggered by an inadequate drainage system in the plains and heavy rain, which caused the river to overflow. According to the Nepal Ministry of Home Affairs (MoHA), the flood was responsible for approximately 150 deaths in 18 districts of Nepal. Sundari’s house was only one of the 100,000 houses that were damaged and a further 80,000 houses were completely destroyed by the flood. ACT Alliance member, the Lutheran World Federation in Nepal (LWF Nepal), which is rooted in the community, was present to respond to the flood. As the rain continued to inundate Kailali through the night, The ACT Nepal Forum, in collaboration with various district agencies, prepared a relief plan. Together they mobilized the relief plan, “since the water-level was above 5 feet, we took a boat to reach the flood-affected people,” said Bal Krishna Chaudhari, LWF Nepal’s coordinator of the Western regional office. Chaudhari and his team provided relief to the affected communities of, Jabalpur village in Janaki Rural Municipality, Gothchaur village of Bhajani Municipality and Bhitraya village of Joshipur Rural Municipality in Kailali. Sundari was one of the beneficiaries in the LWF Nepal response in Bhitraya village. She received rice, pulse, iodized salt, cooking oil, beaten rice, and instant noodles. Apart from these food supplies a dignity kit was provided. “Since most of the families from my village were taking shelter in same place, getting relief materials including a dignity kit meant a lot for me,” Sundari said. 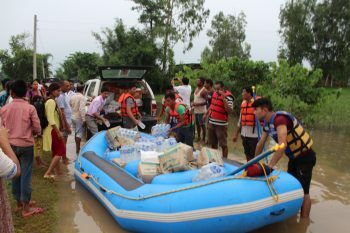 Similar to the response in Kailali, ACT Alliance members have provided relief materials to hundreds of households in Jhapa and Morang districts of Nepal’s eastern development region. In the aftermath of the flood Sundari and her family took shelter at her elder sister’s house for a month. Her husband had migrated to the Gulf and was not present to assist with the reconstruction of her home. With the help of her neighbours, Sundari repaired her house and moved back to her ancestral land, “we supported each other to repair our houses and resettle in our beloved place,” she said. Many of her neighbours have been able to return and settle back in their village. As Sundari and her neighbors resettled on their ancestral land, signs of resilience were evident. Her elder son was able to continue with school and people in the community resumed planting crops and raising domestic animals as they did before the flood. ACT Alliance members and their partner organizations such as Digo Bikas Samaj in Kailali have been a great source of support for the community in rising from the disaster. A Food Grain Bank and an emergency fund that was established by ACT Alliance and its partner organizations before the flood helped the village to avoid a potential famine and provided immediate relief. In a similar response ACT Alliance member, LWF Nepal and its partners are planning to provide temporary shelter, livelihood support, water and sanitation facilities and intend to address the psychosocial and protection needs of the community in Kailali, Jhapa, Morang, Sarlahi and Chitwan districts. ACT Alliance members including LWF Nepal have adopted the Build Back Better approach in their humanitarian response. This response uses the learnings of the past and builds activities based on this experience. It is important to note that the Food Grain Bank and emergency fund set up before the bank was a result of this approach. “The ongoing flood response activities funded by ACT Alliance and other bilateral donors are designed based on a needs assessment and LWF’s previous experience. Therefore, the activities are more sustainable,” says Dr Prabin Manandhar, Country Director of LWF Nepal.